It's been a while since we posted a Quick Pick and Project of the Week, and this is one I've wanted to try for a while now. 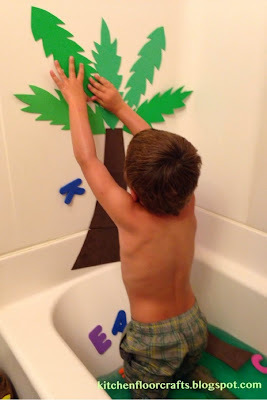 Several years ago I read in a parenting magazine (unfortunately I don't remember which one) that you can use craft foam to create your own wall sticker bath toys. We've done it a couple times now over the past few years to create different shapes and themes. This idea, combined with the purchase a while ago of some bath tub letters, inspired me to create a "coconut" tree for the bath tub to go along with the book Chicka Chicka Boom Boom by Bill Martin. This book has such a great rhyme and rhythm and gives everyone a fun way to practice saying all the letters in the alphabet. 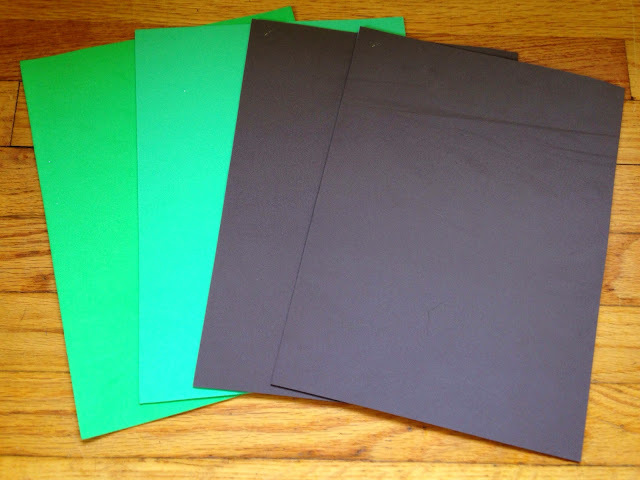 I started with 3 sheets of green craft foam and two sheets of brown foam. 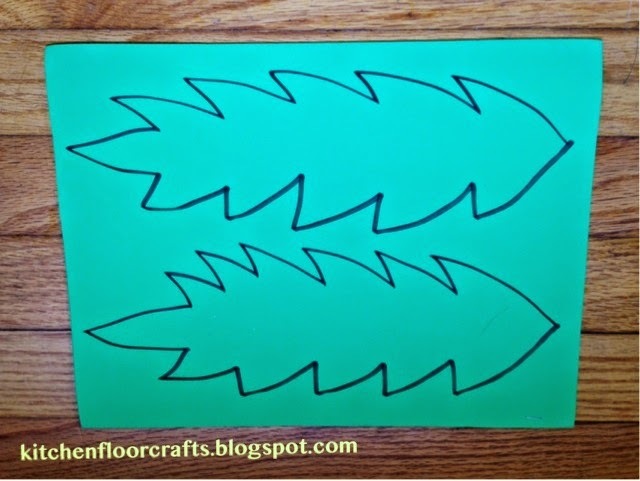 I drew large palm leaves onto the green foam and then cut five leaves out. For the trunk I lined up the two sheets and drew a tree that went up both sheets. 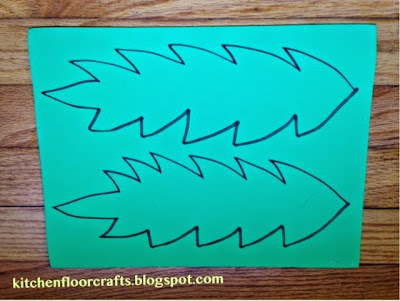 As I cut them out I made the bottom of each piece a little wider then the top of the one below it so it would look a little more like palm tree bark. 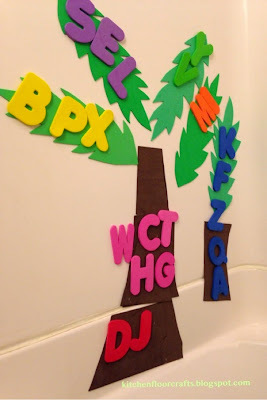 I also added our foam bath letters into the mix. We got ours at the grocery store, but there are several options on Amazon. Before the bath, we read the book so some of the rhyme could be fresh in our minds. When I filled the bath for the boys, I set up the tree the first time. I also added a few of our Crayola Color Bath tablets to make the water a fun color too. Big Brother got right to work adding letters onto the tree. A little later he took down the tree and "built it" himself. This time he sorted the letters out by color. We did it one more time, this time trying to find the letters in order. 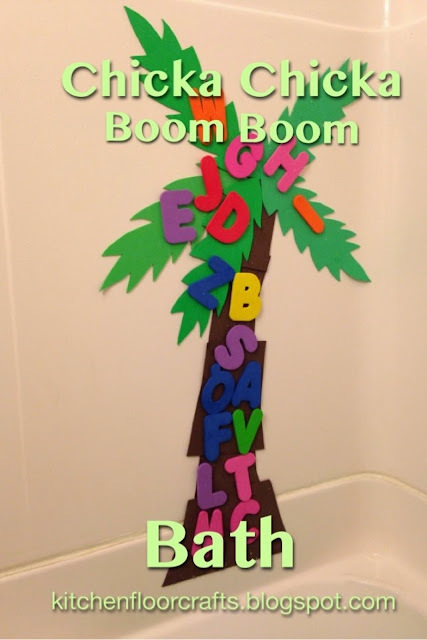 Another fun idea would be to read the book to your kiddo while they're in the tub! 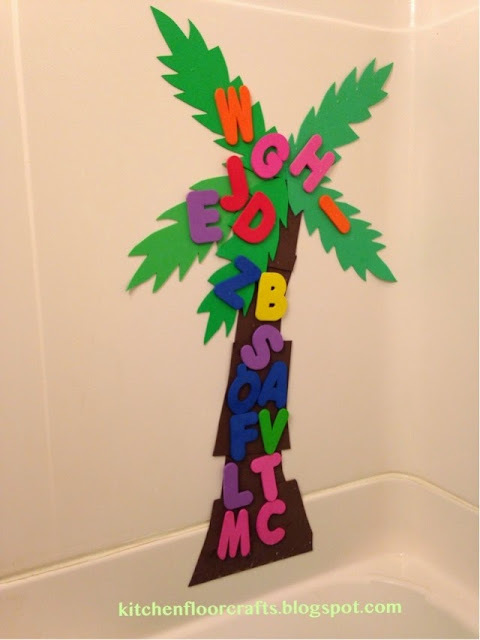 Or, you could do a search and find for the tree, while the adult calls out the letter and the kiddo finds it. Always fun to combine learning letters with play. Have you seen some of our other alphabet play ideas or our Alphabet Adventures? Your tree turned out great!! Cute bath time activity. Thanks Susen! It was a lot of fun too! I'm a sucker for a simple bath activity, I especially love this as we can use it in the shower too! Thanks for sharing! I'm confused- how does it stick to the wall? Hi Jen, great question. The foam sticks to the wall when it's wet. But, it can easily be removed and even if it's left up it won't stay up forever. As soon as it fully dries it will fall off. Hope that helps.